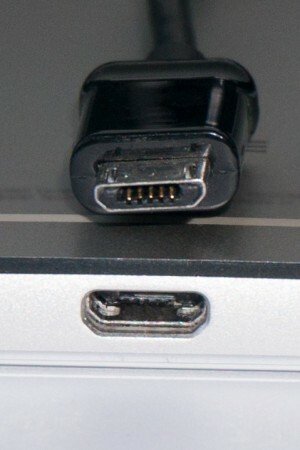 A standard type of USB connector, often found on phones and other mobile devices, for connecting those devices to chargers, computers, TVs, cars, and more. Most phones use it for charging the battery, and also support one or more types of data connection via the same port. A single micro-USB port can support many types of connections depending on the phone settings and the device at the other end of the cable. "Mass storage mode", MTP, and PTP modes allow a computer to access files and media stored on the phone. Data tethering over USB allows a computer to use a phone to connect to the Internet. Some phones support MHL or SlimPort, both of which turn a micro-USB port into a video connector. Some phones also support OTG, which lets a phone connect directly to accessories such as keyboards and memory sticks. There is also an older, larger standard connector called Mini-USB. It has been replaced by newer connectors such as micro-USB, and is effectively obsolete as of 2013.